A Bosnian court ordered that the president of the country’s autonomous Muslim-Croat federation and four other officials be detained for a month after prosecutors said they took bribes to arrange pardons for convicts. 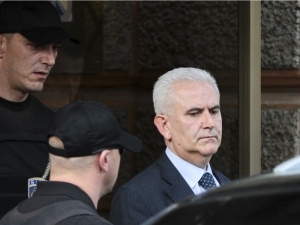 Federation President Zivko Budimir was arrested on Friday along with 19 others in the most high-profile anti-corruption drive in Bosnia since independence more than two decades ago. In handing out the month-long detentions on Sunday, the court said it believed that both Budimir and his co-accused aide Petar Barisic might try to flee the country because they held Croatian passports, a court spokeswoman said. She added that the three other officials were being held because the court was concerned they could obstruct the investigation and influence accomplices and witnesses. Lawyers for the accused said they would appeal against Sunday’s ruling. The arrest of Budimir, who holds top executive powers, looks likely to exacerbate a political crisis that blew up last year when he refused to approve a government reshuffle and the appointment of judges to the constitutional court. The police said 10 government officials were among the 20 people arrested on Friday. Several of the others were suspected drug traffickers with alleged links to officials. Under a US-brokered peace deal to end the 1992-95 war, Bosnia was split into two autonomous regions joined by a relatively weak central government – the federation and the Serb Republic – each of which enjoys a high degree of autonomy.